Amrita recently hosted the show “Punjab De Super Chef Season 3” on the channel PTC Punjab, she was one of the celebrity guest. 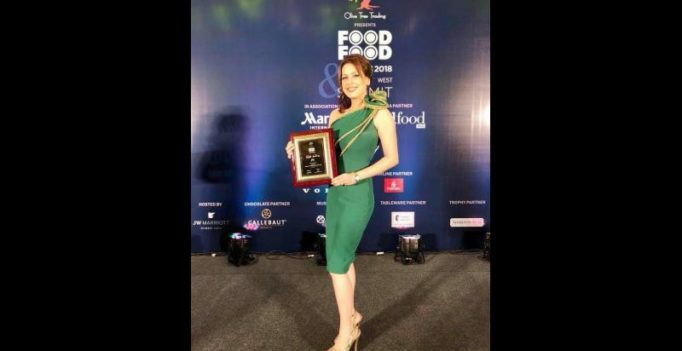 Mumbai: Eminent chef Amrita Raichand has added another star to her glittering collection of accolades by winning ‘BBLUNT Most stylish Chef of the Year’ at Food Food Awards 2018. Amrita was felicitated by Sujit Patel, VP and Head Corporate Communications at Godrej Industries and received recognition for her contribution to culinary arts by India’s most celebrated chef and Padma Shri Awardee, Mr. Sanjeev Kapoor. The stylish chef bedazzled in a grass green dress and upon receiving the honour, stated, “It is a great feeling to stand on the podium of a distinguished stage like Food Food Awards and be recognized for your work by the leaders of the industry. However not much into fashion herself, She very humbly dedicated her award to Chef Kapoor who apart from her cooking also advises her on the way she should style herself for her shows, her husband without whose approval of her clothes apparently, she does not step out to an event and all her close friends who always keep her style at check! Often called a ‘Supermom’, Amrita is best known for her cookery show “Mummy ka Magic” which is one of the longest running & award-winning shows on FoodFood! Having endorsed more than 100 brands and winning several accolades, she is one of the few who is spinning the culinary magic with not just a beautiful face but also her breezy writing abilities. She connects with her fans through her YouTube channel “Being Amrita-Chef and Beyond” and writes fun & relatable articles for her column “Stay Yummy” in Times Life of Times of India that gives her fans a chance to know Amrita, beyond just being a chef.